Update: A few folks more knowledgable folks on the topic, including Cliff Harvey and Sabine Hossenfelder have informed me that this post is “completely wrong.” In particular the experiment was intended to test one wild extrapolation of the holographic principle that is not well founded. Point taken. For a not completely wrong (and quite cogent) take on these results, check out Sabine’s post on her blog. Every now and then there’s a proposal that the universe might be a hologram. Not a hologram in the sense that we’re living in a virtual universe, but rather that the universe obeys the holographic principle, where the physical properties of an enclosed volume can be determined entirely by the behavior of its enclosing surface. At Fermilab an experiment known as the holometer was devised to look for evidence of this holographic effect, and the first results are in. The idea behind the holometer is that if the holographic principle is correct, then (so the holometer team argues) there should be quantum fluctuations within space itself due to its dual nature. This would produce a background of “holographic noise” that could in principle be detected. After a year of observations, the holometer has found no evidence of holographic noise. 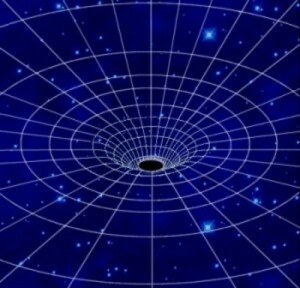 So, it looks like the universe is not a hologram, at least not the easily detectable kind. This result isn’t unexpected given what we know about quantum physics. The experiment has been somewhat controversial because even if they did detect noise it would not rule out other sources of noise. The team is looking at other ways to increase the sensitivity of their experiment, so we can expect to see this story pop up again in the future. “Even if they did detect noise, it would rule out other sources of noise” – missing “not”? Thank you for updating your blog, Brian. This is exactly why I keep coming back to it. Before this entry, I didn’t even know that the topic was controversial (it’s not really my field, after all). My usual news-source, phys.org, made no mention at all about the controversy. I thought it would prove the Buddhists and Ernst Mach are right to believe that sensations (which appears to be two dimensional to me) are the fundamental matter about which we have scientific theory.